Like any capital city, London has a wide range of sporting events to visit and attend. These take place throughout the year and you can find so much to do every month. Planning your visit and being properly prepared for travelling to the event will ensure that you get the best from your experience. There’s nothing worse than not knowing where you’re supposed to be and getting all stressed trying to find your way there! What Sporting Events Are There? Pretty much anything you want is available in the capital. London has some world renowned sporting events played at famous venues, such as rugby at Twickenham, tennis at Wimbledon, cricket at the Oval and, of course, football across the city in many different stadia. Though some sporting events are held at specific venues, it doesn’t mean those sports are confined to these famous places. Cricket, rugby and tennis matches are held in other parts of the capital, and there’s a world of other sporting events to seek out, such as badminton, wrestling, boxing and snooker to name but a few! As well as checking which venue you're going to, find out which part of the stadium your seats are in. Some venues, such as the larger football clubs, are enormous! If you are seated on one side but get dropped off at the other, it can take a very long time to walk round to the other side. London is well served by public transport and, for events in the centre, it’s the best option for getting around. Roads can be congested, preventing timely arrival or delays when you are trying to leave. Venues on the outskirts of the city aren’t necessarily subject to the same issues, so driving to them can be a better option. Check beforehand to find out about the parking facilities, as this can often be an issue. Some venues will have allocated parking for their visitors, but others may not, leaving you driving round and round looking for a parking space! Contact the venue or visit their website. Most venues will have a ‘location’ or ‘how to find us’ page. Usually this will offer all means of access options, from overland rail services to buses, tubes and road access. You can start to build up your journey plan from here. If you live outside of London, your journey will potentially involve more changes. If you’re coming in by train, for example, you’ll need to know what your connections are from the station you arrive in to the stop you need for your event. 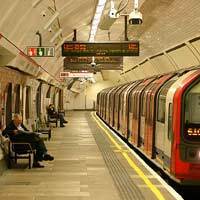 You can download London Underground maps and all London bus routes from the internet, and plan your journey accordingly. Make sure that you leave enough time to make the connections, as tubes and buses crossing London can take quite a long time. Leaving the event should also be planned too, particularly if you want to go out afterwards to celebrate (or commiserate!). Find out when your last train home leaves, and ensure you know which connections you need to make it. Don’t leave it until the last minute – it’s not much fun sleeping on a bench in the railway station waiting for the early train home! Make sure you think about any luggage that you'll be carrying on the journey. You don’t want a big bag to lug about London. Instead, opt for something that is light and easy to carry. Food and drink on public transport can be pricey, too, so you may prefer to bring something from home. The Oyster card is a useful invention for getting around London. It operates on all public transport and you can charge it up and use repeatedly, saving you from having to buy a ticket each time you travel. The cost of the journey is cheaper, too. You do have to pay a £5 deposit for the card, so if you don’t come to London regularly, it might not be cost effective. If you are buying a rail ticket into London, you can have the Travelcard part incorporated so you just have one ticket for all your journeys. Check out the best options when purchasing your ticket.